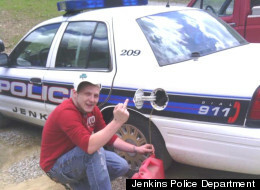 WYMT-TV in Letcher County, Kentucky, reported on Tuesday that the 20-year-old gentleman who appears in this picture he posted on Facebook had been arrested and charged with theft for siphoning gas from a police car. Police were able to identify him because he had posted a picture on Facebook showing him siphoning gas from a police car. The obscene gesture is within every citizen's First Amendment rights to deliver, but probably did increase the cops' motivation to track this particular citizen down. The man and his girlfriend (who took the picture) then demonstrated they had learned exactly nothing about the risks of self-incrimination by giving an interview to WYMT. The girlfriend did try to plead not guilty, at least at first, by claiming no theft had actually occurred. "Yeah, we're sorry," she said, "but it was just a joke. I mean if we was [sic] going to steal gas, we wouldn't put it nationwide on Facebook. We don't steal anyway, but we're sorry." Then he joined in. "I got a little bit of gas," he said. "I ain't gonna lie," he continued, something that his girlfriend might have appreciated knowing in advance. He got a little, "but not much. I couldn't get much. I tried, but there wasn't much in it." So, you posted a picture of yourself apparently committing a crime, then gave an interview in which you admitted guilt and also added that you'd have stolen even more had there been more to steal. Good work there. And a few bonus points: "he says he is not sorry for what he what he did." For previous examples of self-incrimination via Facebook, see "Note: Add 'Judge's Nameplate' to List of Things Not to Steal" (Mar. 9, 2012); "Planking Prosecution" (Dec. 22, 2011) (also police-car-related); and "Facebook: Bad News for Bigamists" (Mar. 29, 2011).